As you can see, there is a definite negative trend over the past three years. 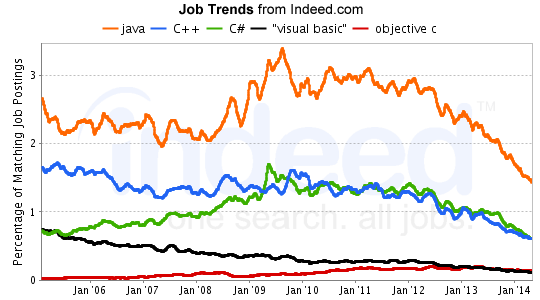 Java continues to lead, but its demand is less than half of what it was at its peak in 2009. 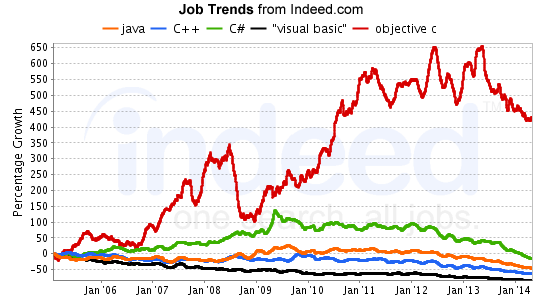 C++ and C# are following the same trend since 2010, which is a steady decline. I finally determined the appropriate search for Visual Basic, and it shows the clear decline over the entirety of the graph. In this installment, Visual Basic demand finally dips below Objective C. Interestingly, Objective C demand stays fairly flat over the past year. Given this, it makes you wonder whether mobile demand is really that high, or whether it is only replacing some of the application development. Normally, I would look at the short term trends from SimplyHired, but the searches are not working correctly, especially for C++ and C#. As opposed to previous posts, SimplyHired’s data is much more current, but still not useful for analysis purposes. Objective C continues to dominate the relative growth, but it still has a declining trend for over a year. The other languages in this analysis are all seeing a negative trend now, with C# just going negative in the past few months. Visual Basic is showing the largest decline, probably over 80%. Obviously, there are a number of reasons for this type of decline among this group of languages. It is difficult to assess whether mobile development affects these trends, especially because Java and Objective C are the main languages for native Android and iOS apps. The rise of alternative languages like Scala or Clojure could be contributing to this, as well as the rise of data science and machine learning. Breadth of languages being used, including mature languages like Python and Ruby, could also be affecting these trends and we will look at these in the next few days.